Quick write up on a 4 day trip I did recently in New Jersey to share with the community here. 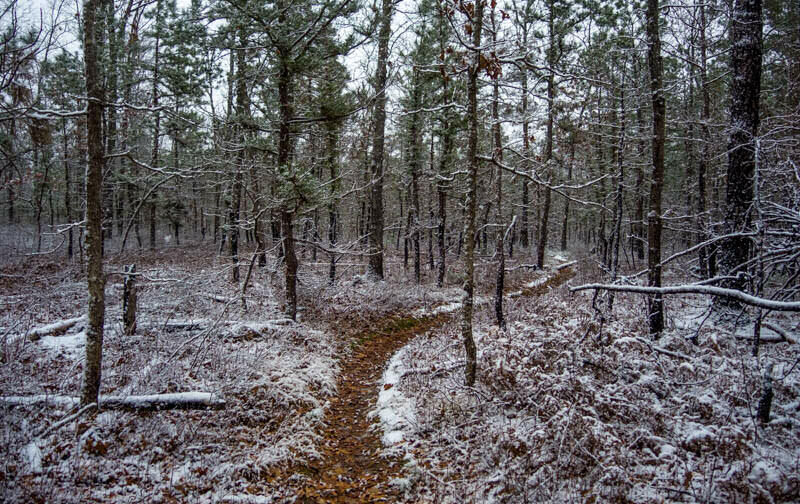 The Batona Trail is a 55 mile backpacking trail that stretches across the pine barrens in southern New Jersey. 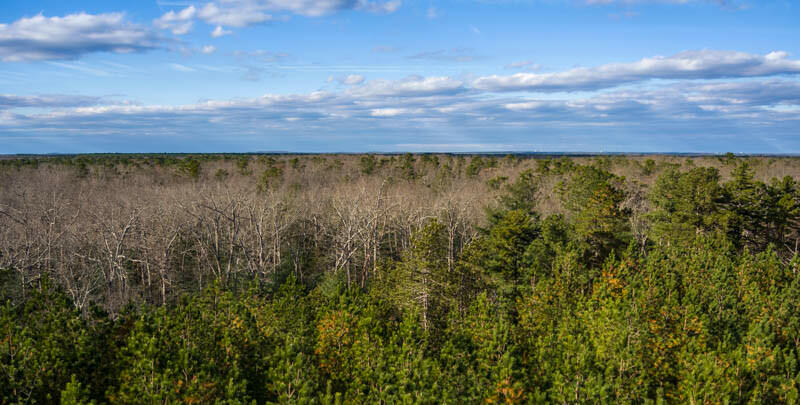 It traverses pine forests and savannas, stands of oak, and occasional cedar swamps as it meanders from Ongs Hat in Brendan T. Byrne State Forest to Lake Absegami in Bass River State Forest. 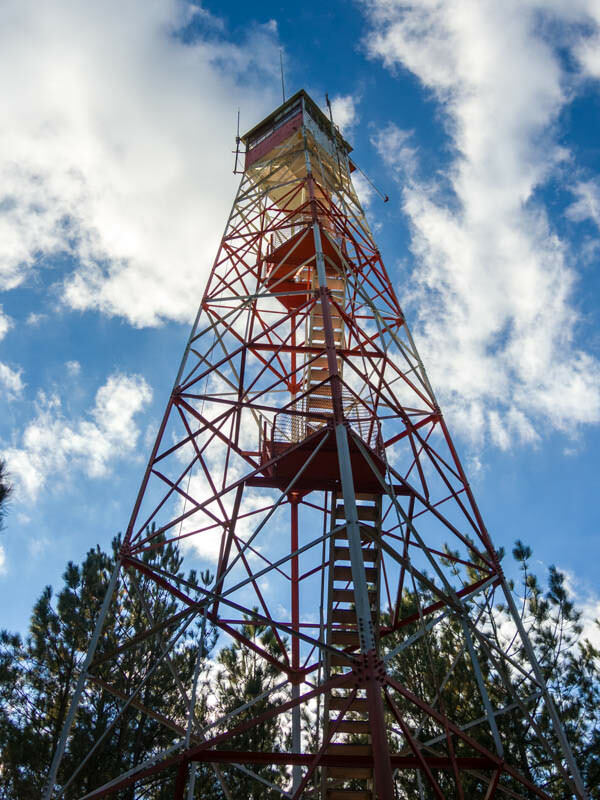 Along the way, it also passes 2 fire towers (one of which is open to the public), and multiple cranberry marshes, ponds, and a few small rivers. The trail isn't really backcountry- there's multiple road crossings along the way- but it does abound with natural scenery and even feels remote in spots. 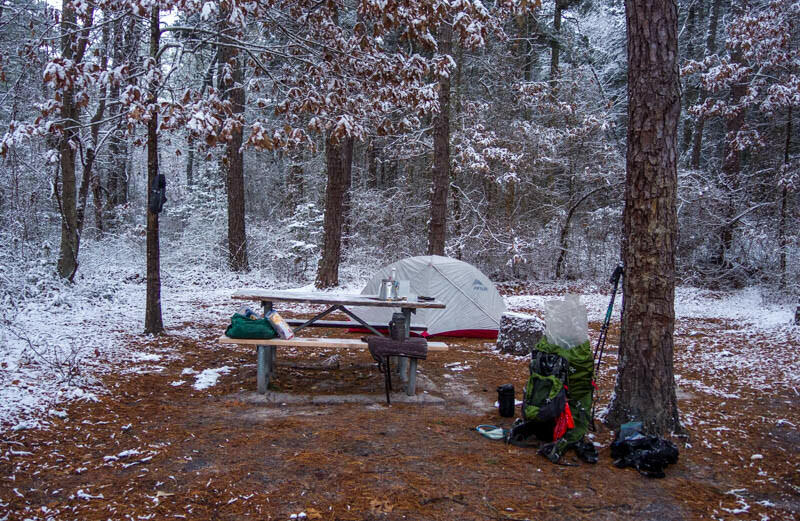 Camping is restricted to established campgrounds, most of which are primitive car-camping areas, but there is one backcountry campground that is only accessible by foot or by canoe (Lower Forge). 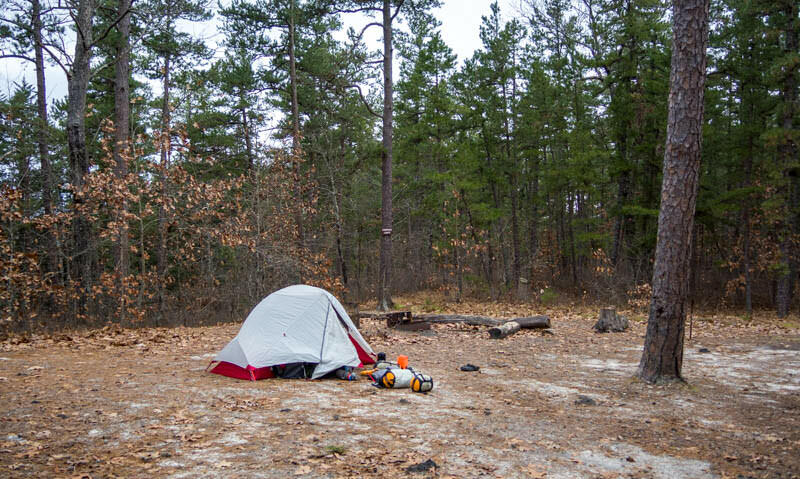 You do need to get a permit from the NJ Forest Service and there is a fee for each night that you plan to camp, but you can also reserve sites online in advance. Additionally, none of the campgrounds (except for the Batona Campground) are actually on the trail itself, but all are accessible via relatively short side trails (up to just over a mile in length). Overall, the trail was OK- the scenery was good, but there was also very little variation in what you saw. The first mile more or less looked very similar to the next fifty-four miles. Highlights included the Four Mile Fire Tower, Pakim Pond, some of the cranberry ponds and bogs in the Parker Preserve, portions of the trail along the Batsto River, and Tub Mill Branch. I would say that this is a trail that one need not worry about hiking in its entirety unless they are a completionist who hates leaving sections of a trail unhiked. For those looking to visit the area, shorter itineraries are possible due to the frequent road crossings. There is also a 15+ mile lollipop route that combines the Batsto River section of the Batona Trail with the Mullica River Trail that could be a nice weekend trip. There is another "backcountry" campground on the Mullica River in addition to the one at Lower Forge, so this loop could be done across 2 nights. I'm actually considering returning to the area at some point specifically to hike this loop with a few friends, as I feel it would be a better (and more enjoyable) introduction to the area for most hikers. 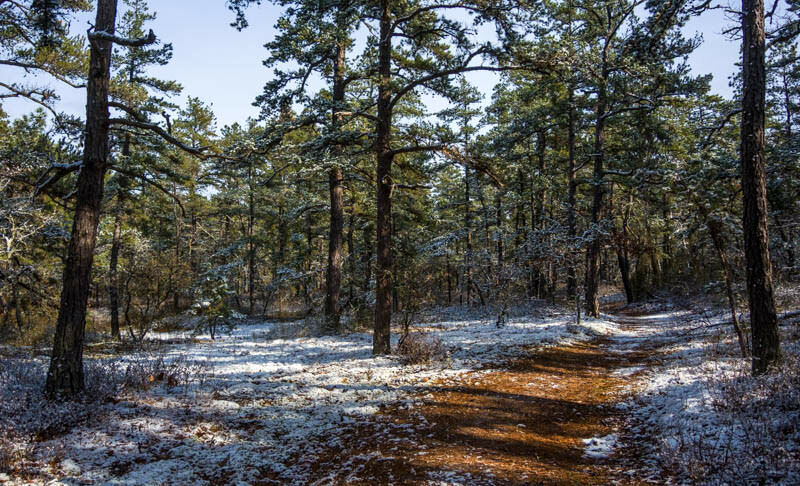 A couple of notes on the mileage- the brochure lists the trail as being 50 miles long, which apparently was true until the trail was rerouted in a few spots, most notably in the Parker Preserve and near Lake Absegami. The brochure has not been updated yet to reflect the new routes at these locations. The trail has distance markers every half mile and these indicate that the distance is 53.5 miles long, although hikers who have GPSed the trail report that 55 miles is more accurate. If I were ever to hike this trail again, I might consider roughly the same itinerary, although I'd probably plan to camp at the Batona Campground on Night #2 instead of the Lower Forge Campground, just to even out the mileage between Day 2 and 3 a bit. I'd wanted to camp at Lower Forge specifically because I knew that it was a walk-in campground, but the Batona Campground also looked quite nice despite being car accessible. One final comment on water: A lot of information about the trail suggests carrying filters as opposed to chemical treatment, as surface water throughout the area can taste quite metallic and filters can help to minimize this somewhat. I did not use a filter, and while the water was drinkable, the taste was noticeable. I would say that this is a trail that one need not worry about hiking in its entirety unless they are a completionist who hates leaving sections of a trail unhiked. I have hiked 1/2 of this trail's miles and I agree with your observation. I much prefer to hike into Mullica Camp, but I only do that when I'm looking for a quick getaway, as I only live 30 minutes from Batsto and Atsion. If you ever need a shuttle let me know. It's a good excuse for me to get out into the pines. Like I posted above, I do have my eyes on the Mullica River/Batsto River Loop as a possible future backpacking trip with a few friends who would be interested in visiting the area, but probably not interested in hiking the full 55-mile trail. So it is likely that I will probably be back again at some point.